This weekend saw 10 boats racing for the Santa Cruz Summer Open. Those that didn’t make it, which include Mike Martin who had to wash his hair(I know, just jealous as I don’t have much..) and has now missed half the California events this year. To the racing, Saturday saw a front pass through early in the morning causing some funky weather, very gusty shifty conditions with the wind out of the North and a windward mark just off the wharf. Don Radcliffe and his team did a great job setting up a race track in very tricky conditions. 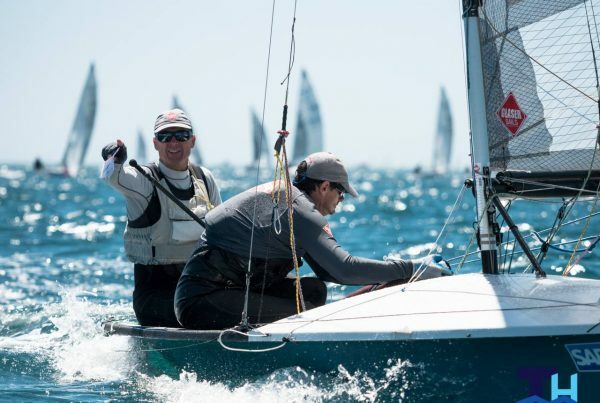 Three races were run and staying in the pressure downwind was the name of the game. Every race was a photo finish with 2,3 and even 4 boats overlapping at the line. When the dust had settled, Eric and Parker had a narrow lead from Carl and Mike who were tied with Steve and Bob and Reeve and Jeff a little further back. Sunday saw different conditions, no wind out to Mile bouy, then big breeze outside that. Don and his team did all they could to set up a race track, even using a Rib as the top mark! With the wind gusting to around 30 at the top mark and one lap races, a crazy time was had by all. The first race saw yet another amazing photo finish with 4 boats coming in at the same time, somehow Steve and Bob edged the finish and really none of us had a clue who beat who with us crossing the line at full speed. The 2nd and last race was just as full on and crazy. Steve and Bob lead from a close bunch, the first 3 gybe set to find some more “sailable” conditions, Reeve and Jeff though “sent it” to the big breeze. We all headed down wind at full speed, all gybed on each other, but out of the spray came Reeve and Jeff at full speed to take the wind from a 3 way tie for 2nd! Great sailing and racing all weekend, thanks to Don and team and the SCYC for running great racing and arranging Pizza and prizes after. Boats are packed and we are off to Bellingham for the PCC’s next weekend.